Wow. 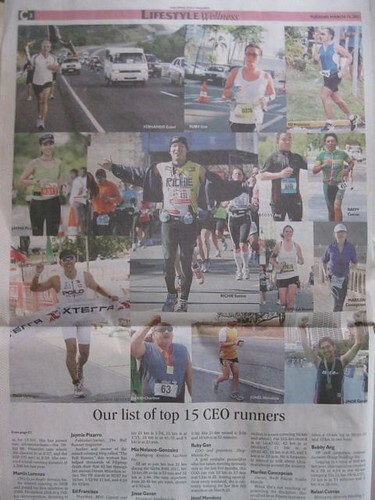 Huge thanks to Philippine Daily Inquirer for including little ol’ me in their list of Top 15 CEO Runners. I am thankful. And, oh boy, I am so not worthy. By the way, they said my 10k PR is 40.57 mins. It’s a typo (although I seriously wish it wasn’t!). Add 6 minutes to my 10k PR which is 46.57. Hi Jaym! Saw the article yesterday and i think that you are so worthy to be part of that list. Good luck on the TBR Dream Marathon on Sunday. As promised, I will be there to take photos. Good thing our head did not bring her newspaper home. I got the section! Congrats, Jaymie! 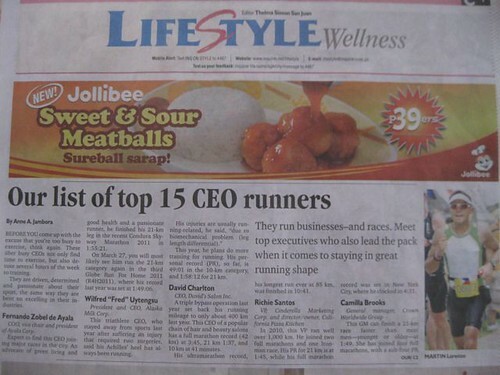 But yes, I was wondering why Toby Claudio of Runnr was not included. How about si Sir Cliff Eala… Idol..